Florida sun and Merry Christmas from Minnesota! Had a wonderful sunny time spent while in Florida. Spent many afternoons either at the beaches of the area, the community pool, or the lanai where there is a pool and hot tub. Temperatures were anywhere from 70-82degrees F for highs. We had a few 49degree F mornings, so those were pretty chilly. When it got that cool in the evening, it made great weather for the hot tub, under the stars. It was a good time. We had a wonderful traditional Thanksgiving with Minnesota friends, Lloyd and Carolyn. They also have a live aboard sailboat, located in Florida, and were able to join us for Thanksgiving, enjoyed the hot tub and stayed overnight. We had a good time. It was a treat for them to have nice hot showers and sleep in a real bed (since they “live” on their sailboat while in Florida). After Thanksgiving, Gregs brother Steve joined us for a week (this is his home we stay at). We bought tickets to Irving Berlins White Christmas and the three of us had a wonderful night. We also had the pleasure of having our grandson, Lane, join us for a few days from Denver. We made the most of beach time while he was there, and he totally enjoyed being buried in the sandy beaches on Naples! We took an Everglades airboat ride while he was there and saw Everglade raccoons among the mangroves! Didn’t think there was such a thing, but there is! We spent an afternoon with Lane before he left at the Community Center pool. There are numerous alligators in Florida, and while Lane was with us, we found a spot near a rest area type pull-off, and there were quite a few! Here is a photo of a big guy sunning himself across the water! Lane really enjoyed seeing these guys! One of the more interesting grocery stores that we found in Naples was “Lucky’s”, where they had a cafe to one side when you first walk in where you could buy a beer or a wine, then go shop for groceries! SWEET! We found this to be our favorite grocery store! We put up Steves Christmas tree while he was with us. It was just too weird while we were there, to get into the Christmas spirit! Being 80degrees F and sunny. So it wasn’t until I got to Minnesota a few days ago, before I felt like it is truly Christmas! So we are now back in Minnesota for Christmas with family and catching up with as many friends as we can. It IS good to be back in the cold for Christmas, but glad it’s a short stay since it’s been overcast, foggy and cold since we arrived. But I don’t think I could truly feel like it’s Christmas without experiencing this. Glad to be back in Minnesota, even if just for a short while! Looking forward to Christmas activities with family! OH! One last thing! A few days before we left Florida we both decided to get MORE tattoos! Yep, we both got tattoo’d again! Those photos are coming, we will just keep you guessing for now! But let me warn you, they aren’t very small (don’t worry, they aren’t huge either). MERRY CHRISTMAS to all my blog followers! I love you all! Author LJs Crazy Gypsy LifePosted on December 20, 2018 December 20, 2018 Categories UncategorizedTags Alligator, beaches, Christmas, Florida, Thanksgiving2 Comments on Florida sun and Merry Christmas from Minnesota! Since arriving back on land, we’ve driven from Florida to Minnesota, visiting family on the way. We found a cute old farmhouse just East of the Twin Cities (Minneapolis and St. Paul) on AirB&B and we will be staying here until the end of July when we drive to Colorado. I couldn’t figure out what seemed so strange to me. Lately I’ve figured it out…the stillness. We are situated between 2 bluffs on the St. Croix River, in a heavily wooded area. So, it is very quiet, and STILL! Very tranquil. And after blowing winds almost constantly over the last 4 months, the (what I’ve discovered) stillness was just SO STILL. But I am getting my land legs back under me, and am enjoying this change. Unfortunately it seems like since we’ve arrived in the U.S., we’ve had clouds and rain! I miss my sun! So we had plans to do some hiking and biking, but it’s been so rainy, it’s just not possible! Our “home” is close to a State Park, but we haven’t had a chance to get there because of the weather! And because of all of the recent rains, both the St. Croix and the Mississippi Rivers have flood warnings! They are really high! We have experienced some great nature while here, we have resident does (deer) that we see at least once a day, and Greg saw a pair of fawn twins in our yard last week (sorry about the poor quality, he took it through the screen). We’ve also had some nice long walks as well bike rides despite the weather (dodging the rain showers), enjoying the nature on land. Summer butterfly on a flowering plant in our yard. Hoping that we get more normal summer weather while here in Minnesota! Royal Arch, notice the people on top, who hiked up there! Not me! The trails to the Royal Arch. It was pretty strenuous, so glad I had my hiking sticks (photo of me hiking down)! Totally saved my knees! 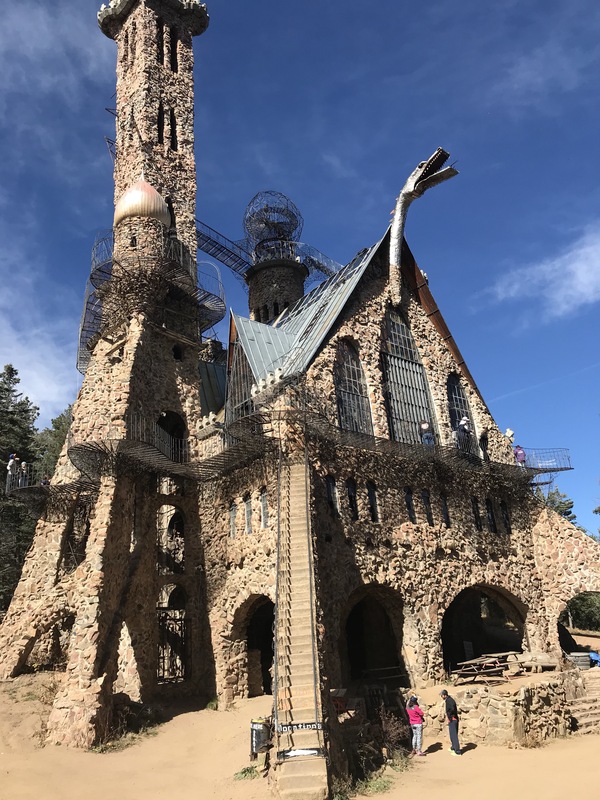 Also during the last part of our trip, we brought our grandson, Lane, to Bishops Castle. Bishops Castle link It’s a spot where we took our kids, Clint and Sheena, in the 1990s. Back then, there weren’t 3 floors like there are now. 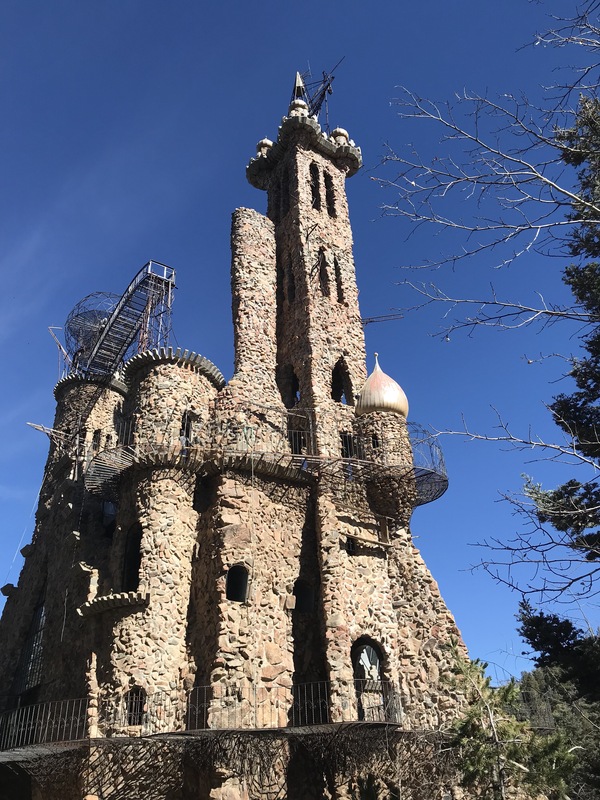 The story is that this guy, Jim Bishop, has been building this castle over the last 60 years, by hand, stone by stone. It is free, and accepts donations to continue the building of it. The next plan is to build a mote around the castle, providing they have the donations to do this. 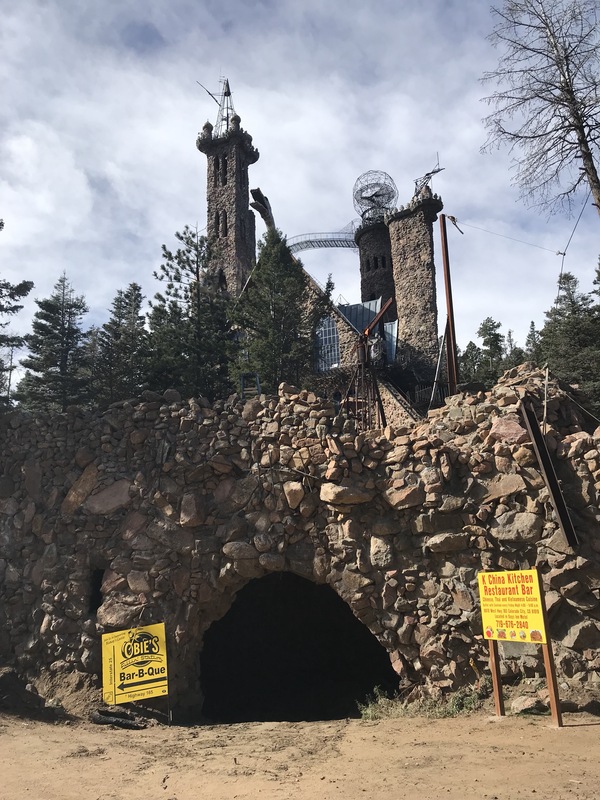 Jim is still alive, and when talking to the gift shop cashier, when Jim is no longer able to build the mote, his children plan on continuing this project. Next on the list was to visit Pearl St. in Boulder. Pearl Street is a walking plaza with many restaurants, artists and musicians. After a hike, we stopped for a bit of lunch and found this musician, playing the piano, upside down. It’s an amazing plaza! We also took the cog train to Pikes Peak. This is the 2nd time for this trip (first time was with Clint and Ashley, my son and daughter-in law a few years ago). If we were lucky, we might see some bighorn sheep. Apparently, this cog train concept is used frequently in Switzerland, where most of these trains are located. This cog train, is the highest in the world, at 14,100 feet, also has a perfect safety record. Photo outside the window of the cog train going up to the summit of Pikes Peak. We are above tree line here (about 12,000 feet) hence, no trees to be seen! I THINK we may have seen the backsides of 2 bighorn sheep, but they were WAY FAR OFF! Photo at the summit of Pikes Peak, 14,100 feet. Greg in the foreground. 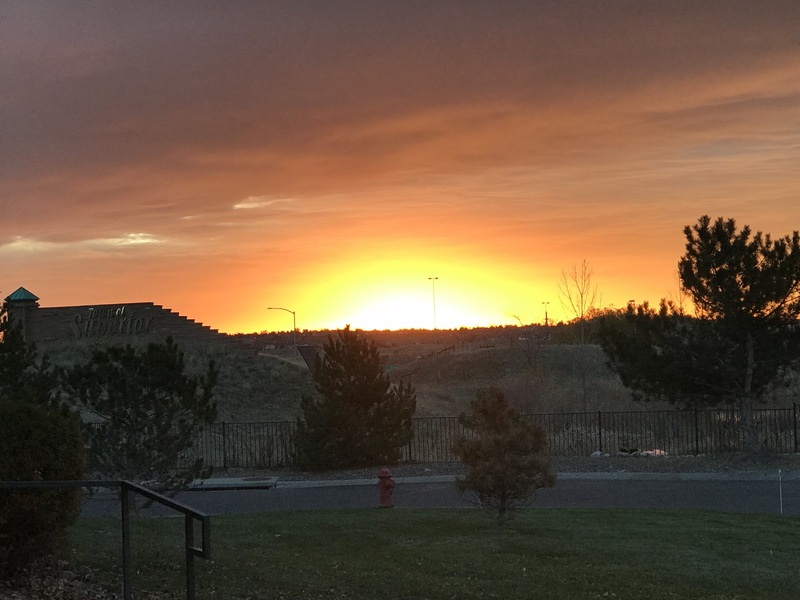 Being in Colorado showed some amazing mountain sunrises (see below). 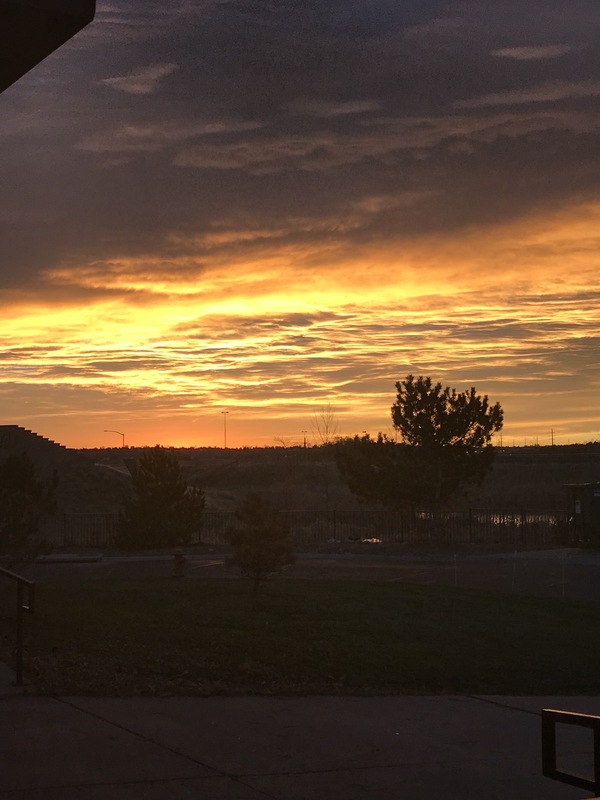 I will miss these mountain sunrises, but am looking forward to seeing those Atlantic sunrises next week! It’s coming so fast! 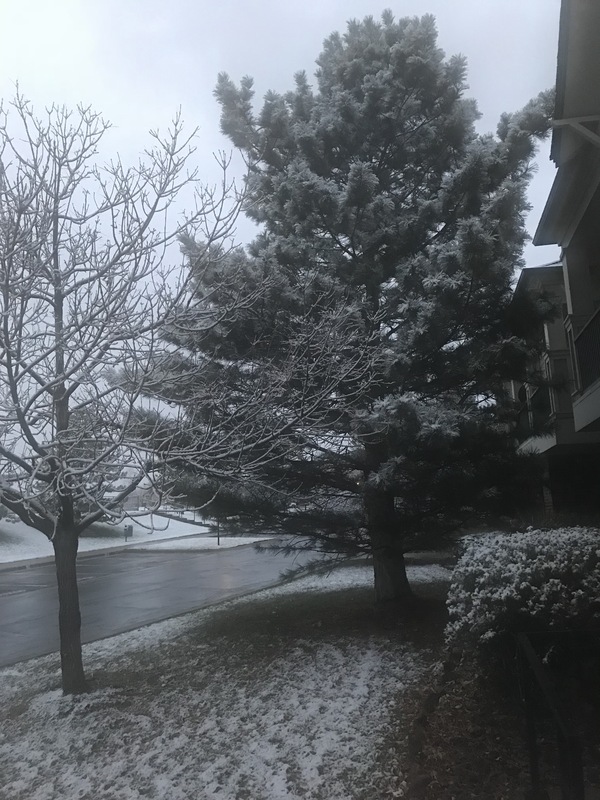 One last beautiful snowfall and hot tub time was also experienced in Colorado. It made me miss the winter hot tub times. I guess the next “land home” we have just might have to have a “little” snowfall during the winter, with a hot tub. It’s so ethereal! Snow fall, photo from in the hot tub. Cozy winter day, snow falling, reading, tea. Finally, the last hike in Colorado. My feet felt SO GOOD coming out of those hiking boots! So, the boots will be retired into storage until next summer. Colorado has been an awesome experience. We will miss it, and look forward to returning next year. After the hike, we found one of our favorite places in Boulder, the Daneshab Teahouse, and celebrate with wine outside-one of the last 80 F days we will probably see until we arrive in Martinique on Nov 17. Oh my feet felt so good out of those hiking boots! Great wine at the Teahouse, on a beautiful warm day in Boulder, after hiking. 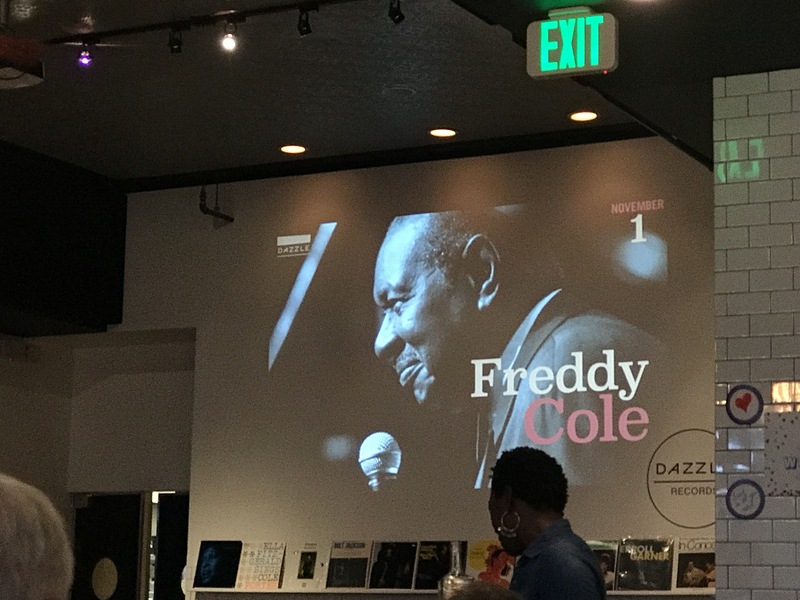 The week before we left Colorado, I was fortunate enough to discover that Freddy Cole, jazz musician, was to be playing in Denver! We got tickets and had an amazing time. The venue was in a restaurant and the tickets we got put us front and center of Freddy. Dinner was great! He is 87 years old, brother of Nat King Cole, and still has a great show! Greg, Freddy Cole and I, signing the CD we bought. So, on to the next chapter. We’ve spent the last 2 weeks (since we got back to Minnesota on Nov 5), visiting family in Kansas City (on our way to Minnesota), visiting parents in Minnesota and Illinois, visiting kids and grandkids in Minnesota. We are “living” with my daughters family while we prepare for our trip to Martinique on Nov 17 (5 days from now). While traveling, I also tried to find and visit as many Yoga studios as I could (considering I’m a Yoga Teacher, I needed my yoga fix!). While back in Minnesota, I was able to attend a yoga class this weekend at my local yoga studio, Urban Yoga. If anyone is in the Rochester MN area and want an awesome yoga studio, I highly recommend they check out Destiny at Urban Yoga MN . Unexpectedly, I saw TWO super good friends! What a blessing that was! So, next blog will probably show 85 degree days and amazing sunrises and sunsets! Stay tuned my friends!